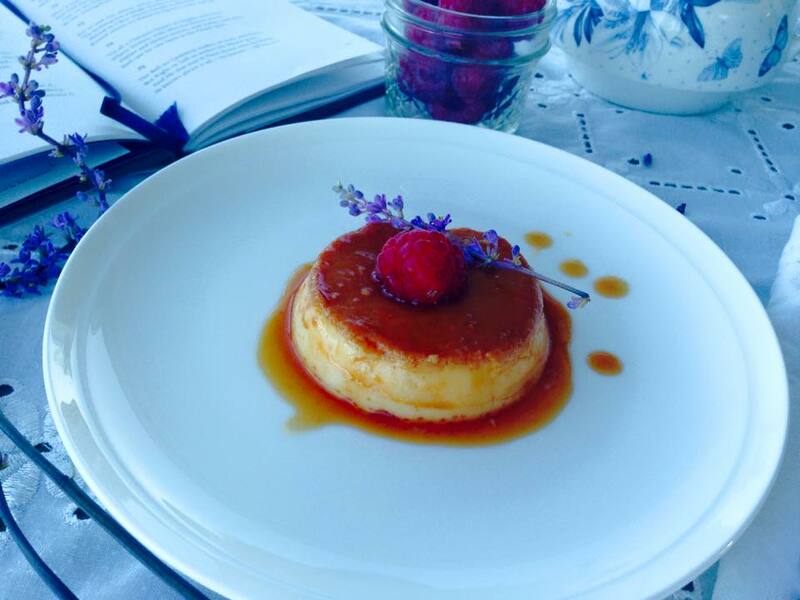 This crème Caramel recipe comes from my mum, Nawal. It is perfect, easy, delicious and fool-prof. Unlike other recipes, this one is straight forward and you can easily divide it or multiply it. My mother has been making it ever since I was a little girl, and she taught me how to make it on her first visit to Sydney. At the time, I was so happy to have her in my kitchen, and took advantage of her presence to learn as many recipes as possible. After all, she is a fabulous cook . 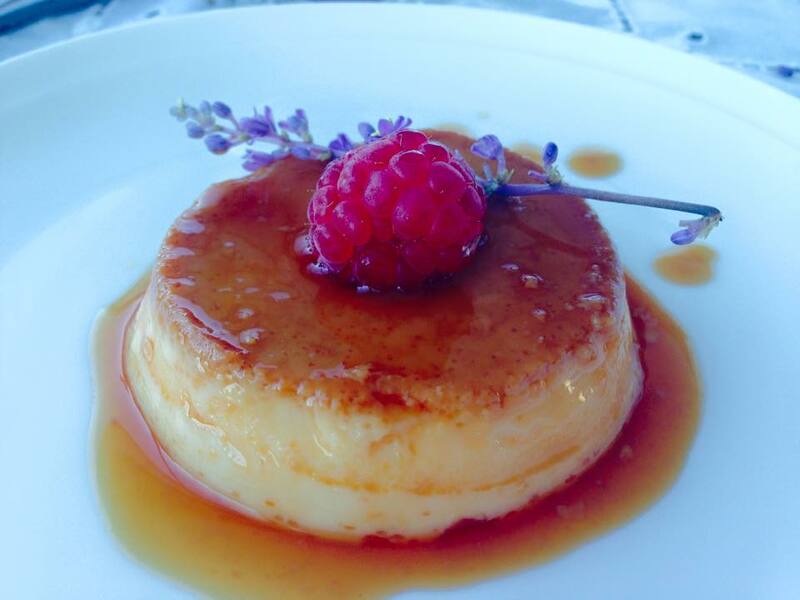 People usually perceive Crème Caramel to be a fiddly and a difficult recipe, and it can be but not this one. The main reason is because unlike many recipes that tell you to bake it in the oven, I do it on top of the stove. 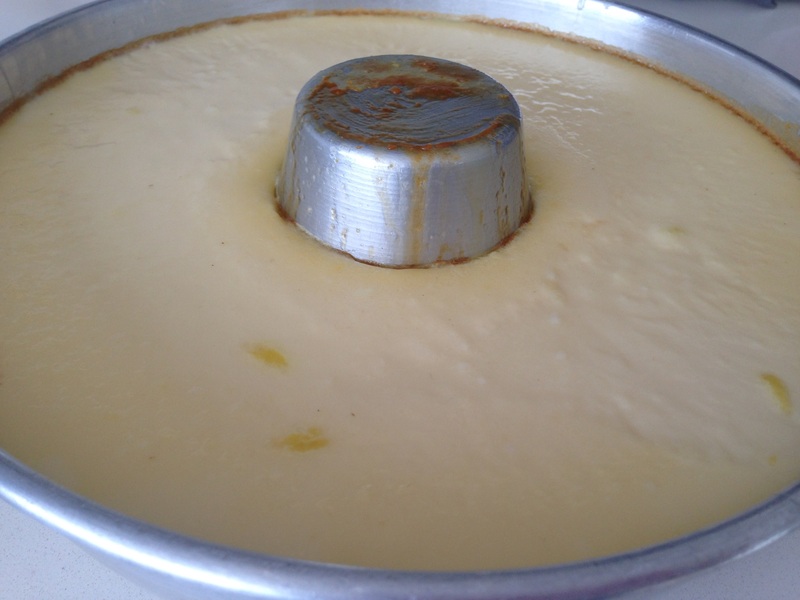 This step eliminates any risk of the custard being not fully cooked in the centre, or too cooked on the sides. I always end up with a creamy milky-white texture that melts in the mouth. Most recipes tell you to use warm milk, cream or to separate some eggs because you need extra egg yolks. 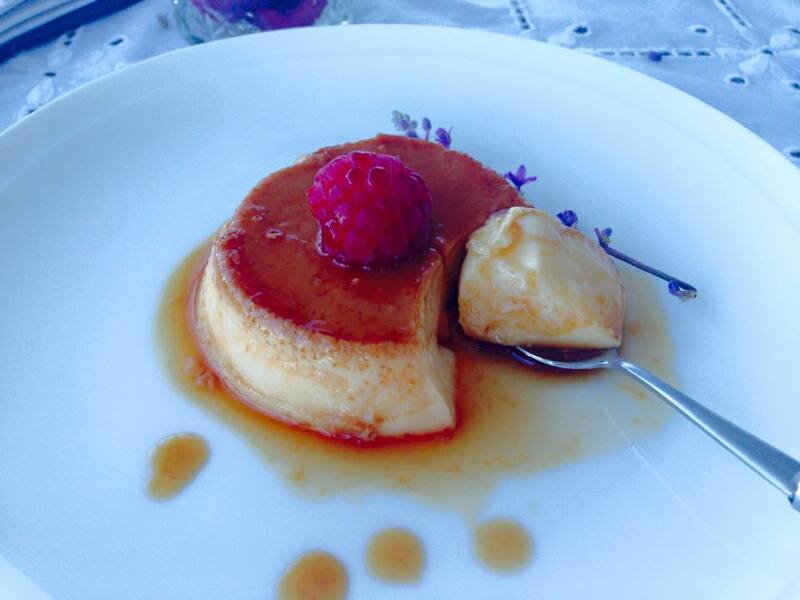 My recipe requires none of that, and you are left with a light and not too overly creamy or heavy Crème Caramel. And for those who do not like this dessert because they find it too eggy, I use the zest of a whole lemon, which adds a lemony flavour, and fixes that problem. To simplify the process, it is also important to have the right kitchen utensils. 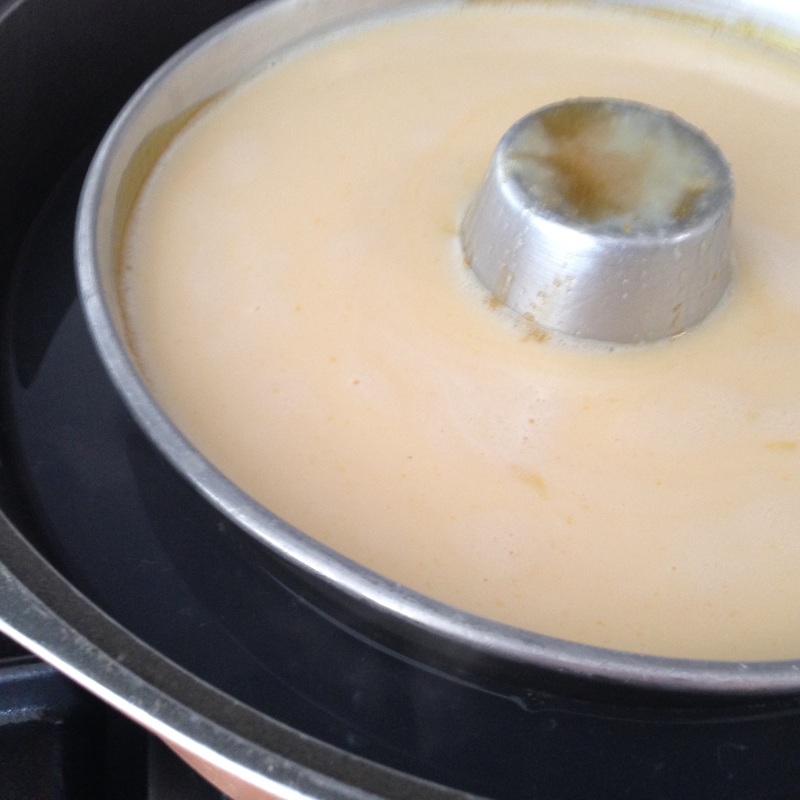 A wide and low cooking pot is a must, otherwise you cannot lift your Crème Caramel when it’s hot. You need to have enough room to handle it. I am using a 25 cm wide baking ring. You can use a 20 cm round baking tin, but make sure it is at least 7 cm deep. Otherwise use eight 1 cup capacity ramekins, for individual servings. I have to admit that if this is the first time that you are attempting a Crème Caramel, you might find it a bit overwhelming. I promise though that the next time around, once you worked out what to do, it will be so much easier. 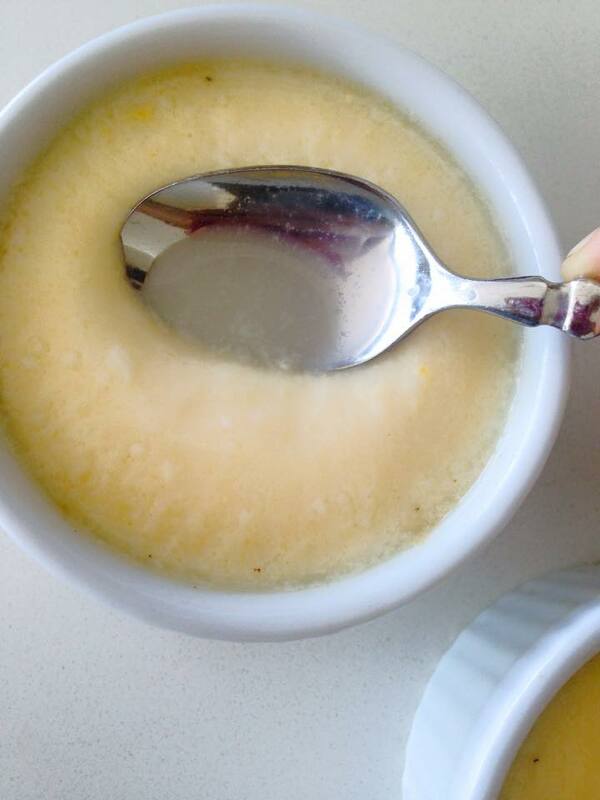 Beat eggs with vanilla essence and lemon zest in a bowl, add sugar and beat again until creamy. Add milk and let it sit aside, allowing the lemon to infuse while you prepare the caramel. 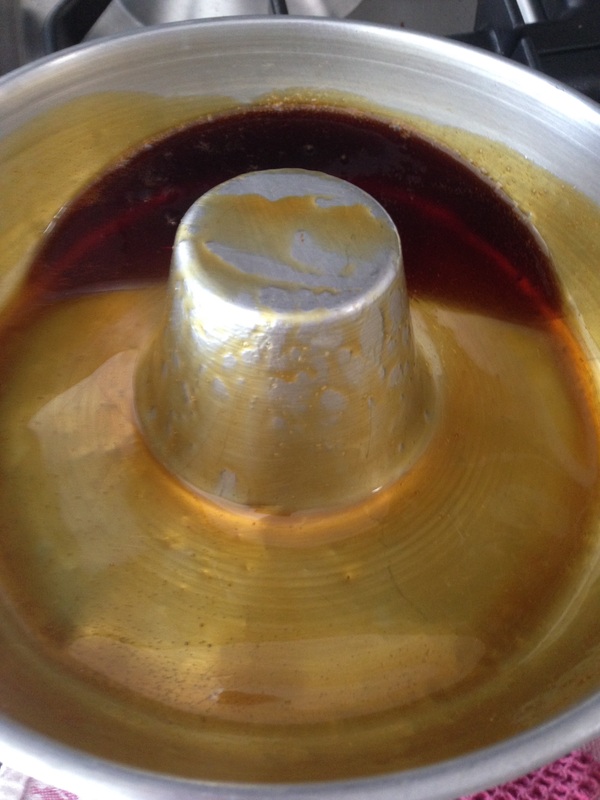 Have your mould or ramekins ready on the bench-top, and have your large pot ready on top of the stove, because when the caramel is ready, you need to work fast. Pour sugar and water in a small pot and place it on high heat on the stove. Let it boil, and simmer until it starts to caramelise. You can stir it once it becomes liquid and sides are browning. If it crystallises, don’t panic, just wait and be patient and it will turn to liquid. Remove off heat as soon as it is a golden colour, and pour into the mould that you are using. Do not leave it sitting in your pot, it will continue to cook and will burn. Take care as sugar will be very hot. Hold the mould with a cloth, it will turn hot instantly, and rotate the caramel around the sides of the mould. 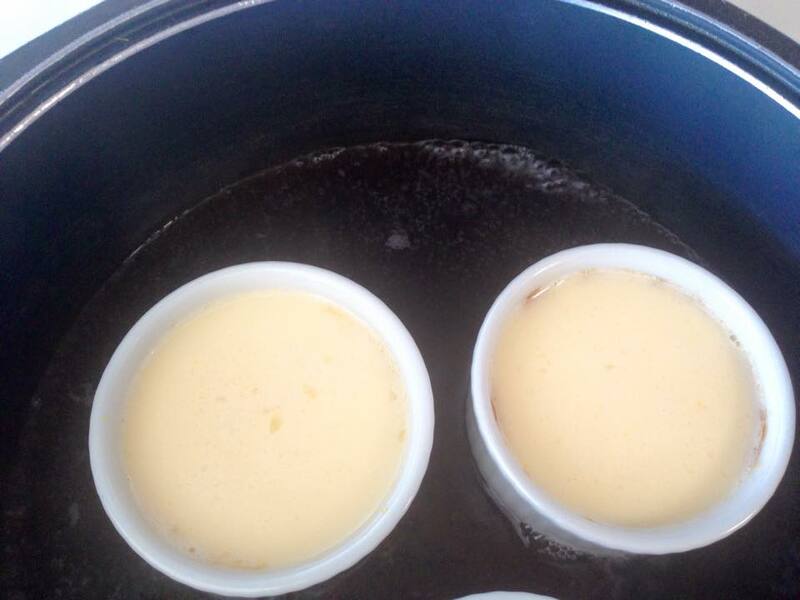 If you are making individual crème caramels, divide the caramel between your ramekins. Pouring the crème through a fine strainer into the mould. Place the mould inside the pot, and pour the milky mixture of crème into it through a fine strainer. 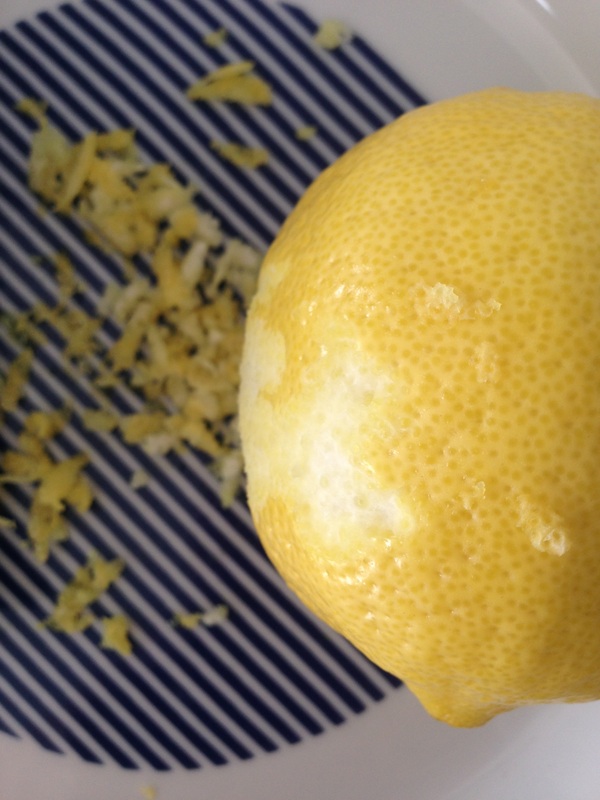 This will remove all the lemon zest and any egg shells or egg that hasn’t blended in well. Pour water in the large pot to fill half way up the mould.Turn heat on, cover and bring water to boil, then simmer gently for about 20 minutes. If using ramekins, the crème caramels should be ready in about ten minutes. Crème is firm, off the stove and cooling ff. It is important that you check it after 15 minutes, you need to remove the mould as soon as the top has cooked. if using ramekins check it earlier. 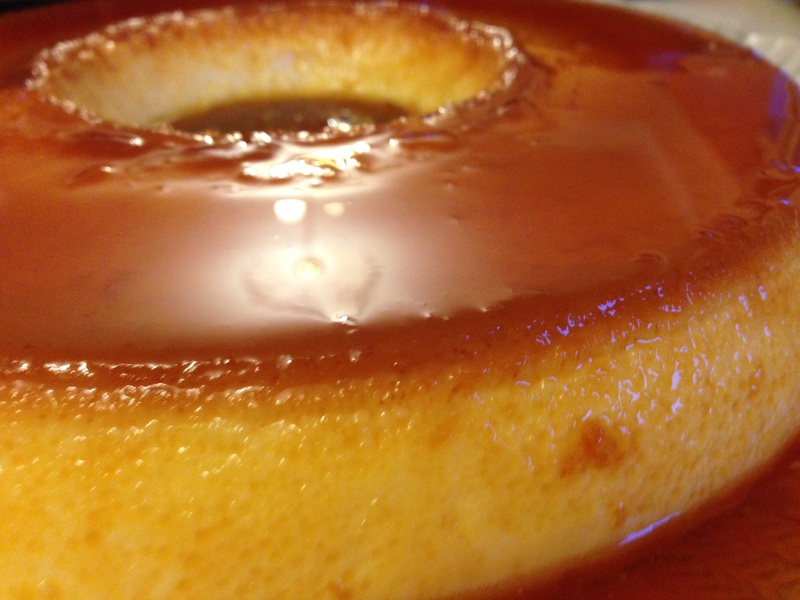 If you leave it too long, you will end up with holes in your crème caramel and the texture will not be as creamy. 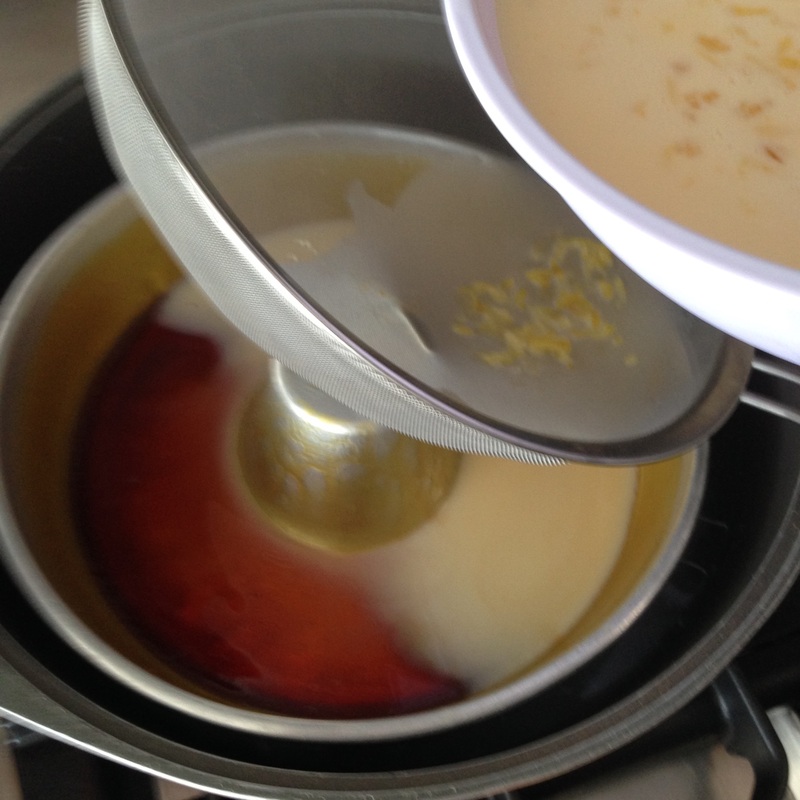 Test it by placing a spoon and scooping out any extra fluid from the steam (picture below). You can see that it has become firm. Remove and Leave to cool, then refrigerate for a minimum of six hours or overnight. To serve, place a knife around the edges to loosen the crème, then place a 1 cm deep plate on top of mould or ramekin and flip it quickly. Pour the caramel on top. 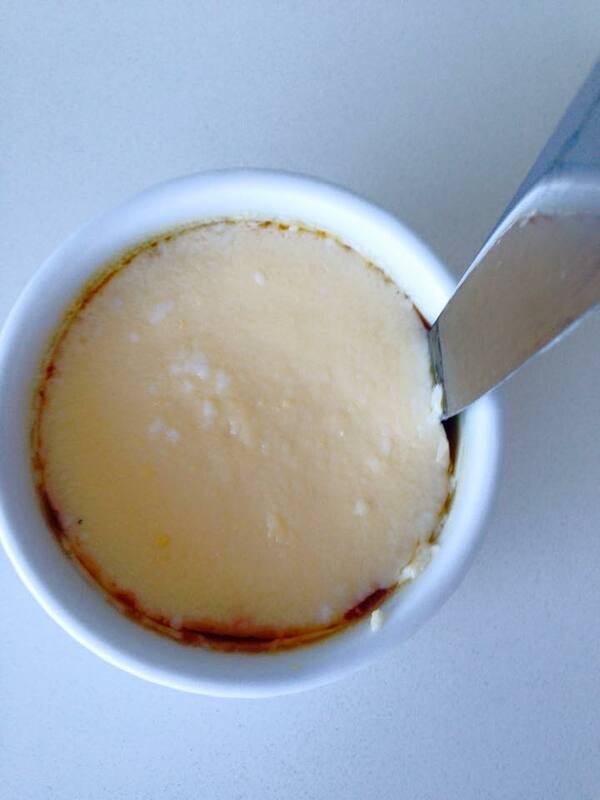 Loosening the sides with a knife prior to flipping the Crème Caramel. 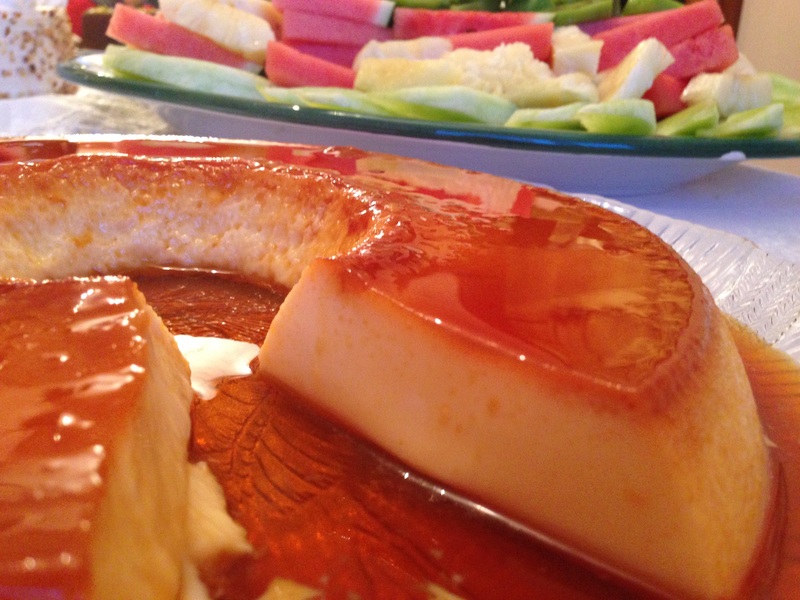 Tags: creamy, creme caramel, delicious, dessert, food, glutenfree, mother, mother's day, motherhood, recipe, sweets. Bookmark the permalink. Absolutely gorgeous, Zeina 🙂 I will definitely try this crème!